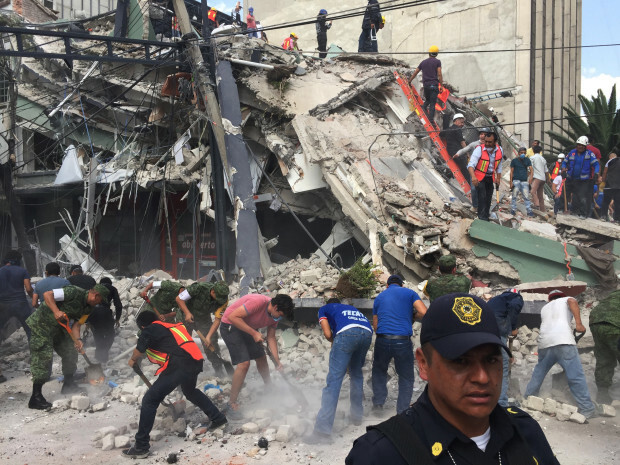 MEXICO CITY — When a devastating earthquake rocked Mexico City on Tuesday Sept. 19, 32 years to the day after another deadly temblor, the city’s traumatized inhabitants struggled to understand why disaster had struck twice on the same date. Just two hours after a city-wide seismic drill to mark the earlier tragedy, Mexico City was shaken by a magnitude 7.1 quake, its second major tremor in less than two weeks, which killed at least 100 people in the capital and 230 nationwide, according to Reuters. “It seems like a thing of the devil,” said Luis Pastrana, a 52-year-old industrial designer who lived through both tremors. “Another Cursed September 19,” Mexican daily El Economista proclaimed on its front page on Wednesday. In Tlatelolco, a modernist housing project, residents gather every Sept. 19 for morning mass at the site where two tower blocks collapsed 32 years ago, killing hundreds. Situated at the intersection of three tectonic plates, Mexico is one of the world’s most earthquake-prone countries, and the capital is particularly vulnerable due to its location on top of an ancient lake bed. Tuesday’s quake striking on the 1985 anniversary appeared to be purely coincidental, said Jana Pursley, a geophysicist with the United States Geological Survey, noting that the epicenters were hundreds of kilometers apart. In a phenomenon known as the “anniversary effect,” distress levels can spike as the date of a traumatic event approaches, Willems said. The repetition of the event would have compounded the stress, she added. “It’s almost like working with someone who was in Manhattan during the events of September 11. It’s almost a question I ask automatically: Where were you that day?” she said. “I say that coincidences don’t exist,” he said. “This was something I don’t know how to classify.